And here at The Laughter Shoppe, you can still order by mail. How cool is that? To make it particularly enticing to do so, we offer totally FREE SHIPPING (for d​omestic orders)! Just download the mail order form, fill it out and send it in with a check. If you'd like to pay with credit card by mail, you can do that, too! Just download the credit card form and include it in your order. Thanks! Shop for T-shirts, jewelry, framed posters and other exciting print-on-demand products with Laughing Laura's colorful, laughing designs at CafePress. What one word defines you? Examine this provocative question with Living Word, a fine art book by Laura Gentry with black and white photographs by William Gentry. It offers a fascinating collection of portraits and personalities, which invite readers to embark upon their own journeys of self-discovery. Along the way, it teaches the vitality of language, the power of the living word. Read more. Vive tu vida desde la alegria. Este programa de 36 minutos te mostrará cómo. Con una introducción sobre el movimiento mundial de la risa, iniciado por el Dr. Madan Kataria, médico de la India y su esposa la señora Mhaduri Kataria, este CD contiene una sesión interactiva de ejercicios de Yoga de la Risa guiados por la pionera de esta disciplina en Chile, Maestra Tosha Tobias y practicado por un grupo muy entusiasta de risueños. Con ejercicios de preparación; de risa contagiosa; respiración yóguica profunda; y relajación guiada, es seguro que sentirás la salud y la alegría vibrar en cada una de tus células. Spanish language Laughter Yoga Resource. Cadres of enthusiastic laughers from around the globe have joined forces to bring you this unique collection of zealously blasted laughter. It features Laughing Laura, a giggling mover and shaker in the world of therapeutic laughter, and The Laugh Man, Doug Collins who s been hailed as the man with the most contagious laugh in the world. His runaway YouTube hit Dad at Comedy Barn was played on Good Morning America and to date has over twenty-four million views. These two are joined by a host of other talented laughers and a laughing jazz trumpeter. Recorded in part in the legendary Sun Studio of Memphis, Tennessee, the contagious peals of fall-to-the-floor laughter will lift you every time you listen. Just be sure to laugh responsibly! Read more. 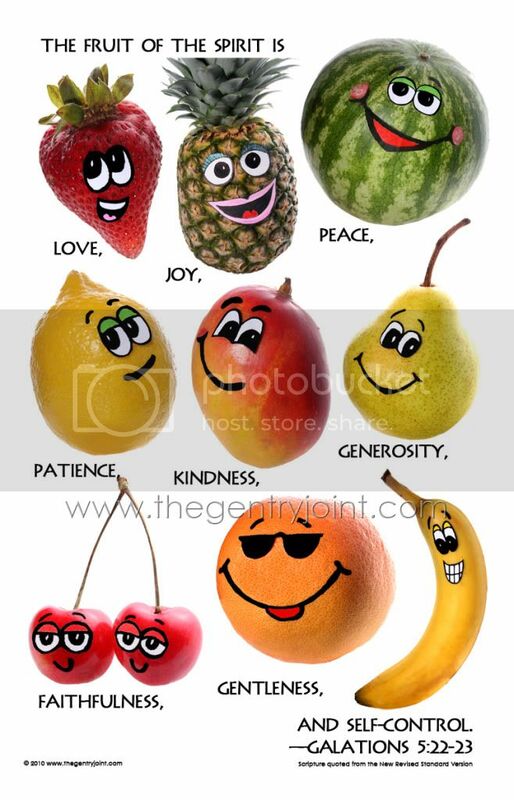 This humorous and literal translation of the "Fruit of the Spirit" verses (Galatians 5:22-23) features photos by William Gentry. 11x17 inches. Ships in a hard-shell tube. View larger. Wants big laughs? This little book is packed with them. A handy Laughter Yoga resource, it boasts a treasury of creative laughter and yoga breathing exercises. With descriptions, hilarious photographs, and inspirational quotes, Laughing Laura empowers you to zealously practice Laughter Yoga. At 3.5 inches by 5.5 inches, this 172-page, softcover, spiral bound book is small enough to go everywhere with you so you'll always be ready to laugh. "I am delighted the Laughing Laura has written this useful resource book of creative laughter and yoga breathing exercises." —Madan Kataria. Read more. Join Laughing Laura and her Laughter Friends in this fun, easy-to-follow Laughter Yoga workout on DVD—the only one of its kind! This program contains a high-impact Laughter Yoga workout designed specifically for children, complete with a warm up, deep breathing, catchy tunes, guided relaxation and 27 unique laughter exercises. Each part of the workout is demonstrated by Laughing Laura and her 19 Laughter Friends, children ages 4 to 12. The whole family can exercise together with this easy-to-follow routine and cultivate a more positive outlook on life. Recommended by the American Library Association. Read more. 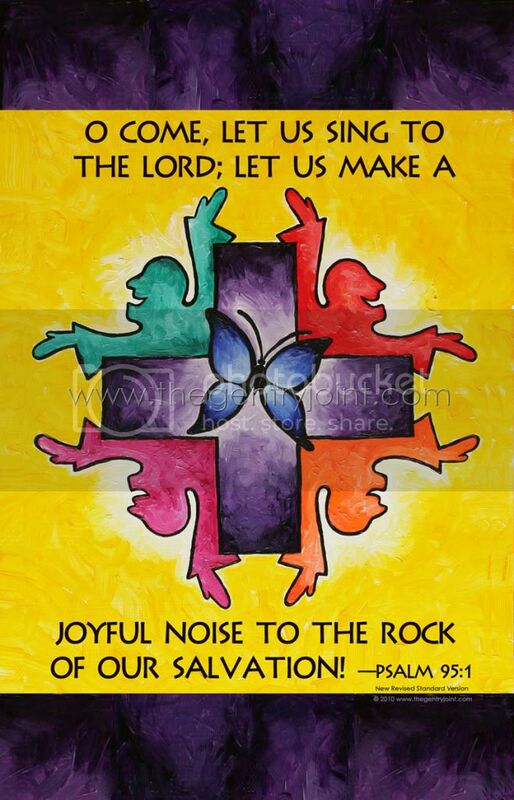 These five paintings by Laughing Laura depict the joy and freedom of life in Christ. Now you can have them all as a full color, 11x17 inch poster. Read about each painting and the accompanying devotional scriptures here: Free, Indeed! Ships in a hard-shell tube. View larger. 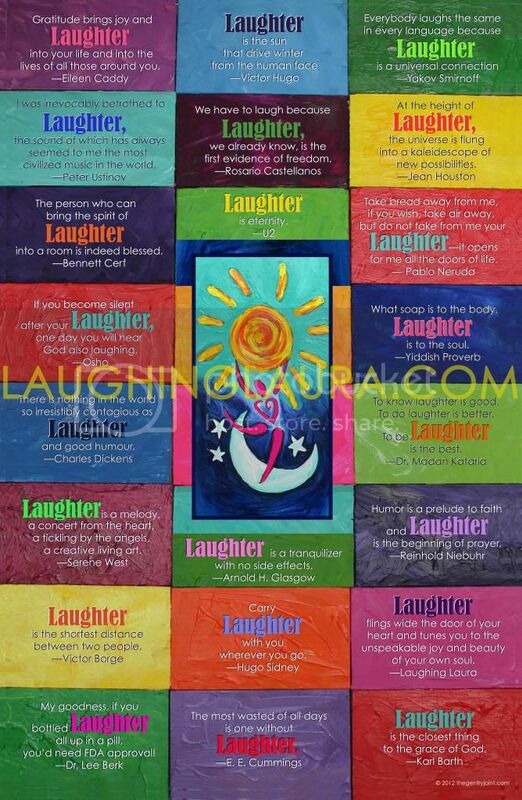 This inspirational poster is a print of Laughing Laura's original painting. It's covered in hilarious ways to live a laughing life. 11x17 inches. Ships in a hard-shell tube. View larger. ​Brace yourself to take merry to a whole new level with this outrageously jolly Christmas album. Giggle along with Laughing Laura and the Fabulous Laughers as they laugh the Christmas carols played by the Tom Bourcier and the Luther College Jazz Quartet. It is an instant party that will have you swinging and dancing all night. Expect your holiday cheer to reach new heights. Yule laugh, that's for sure. Fa-la-la-la...ha ha ha ha! Read more. TODAY IS A LAUGHING DAY CD Happy songs for kids and kids at heart is the name of the game on Laughing Laura's jazz album. This upbeat collection of 15 original songs and cheers is the first ever laughter themed children's album. Laughing Laura and the Gigglers are accompanied by groovin' jazz trio. Today is a Laughing Day delivers big, swingin' fun sure to inspire lots of laughing, singing and dancing for the whole family! Read more. Laughter is the best medicine and you can get a daily dose with this easy-to-use resource. Center yourself in the morning with yogic breathing and laughing alone. Then, invigorate at noon with a laughter dance party. Finally, unwind at bedtime with a relaxing meditation called yoga nidra to help you cultivate the inner spirit of laughter. Together, this 75 minute program is a do-it-yourself laughter makeover that will help you not just enjoy laughter but actually BE laughter! CD comes with an instructional booklet to support your practice. Dr. Kataria, founder of the Laughter Yoga movement calls this album "revolutionary!" Read more. Let laughter ring with this vibrantly colored, museum quality 2"x2" magnet. It features Laughing Laura's original "Ha Ha Spiral" painting. Bring some laughing cheer to your refrigerator with this vibrantly colored, museum quality 2"x2" magnet. It features Laughing Laura's original "Be Laughter" painting. Be inspired by this colorful poster designed by Laughing Laura. It boasts 22 quotes containing the word "laughter" by notable people. 11x17 inches. Ships in a hard-shell tube. View larger. Make writing more fun with the official Laughing Laura bird pen. It stands up on its own and has rubber, koosh-ball-like feathers. Imprinted with LaughingLaura.com on the stem, this adorably funny bird is sure to make you laugh. See it in action. LAUGH YOUR WAY THERE CD Say goodbye to stress on the road with this unique CD. Laugh your way to health and happiness as you drive or ride your daily commute. Using the principles of Laughter Yoga, a worldwide movement initiated by Dr. Madan Kataria of India, you will laugh, cheer, do deep breathing, positive affirmations, happy chants and more thus transforming your commute time into an exercise for mind, body and spirit. Each exercise of this 23 minute workout is introduced by Laughing Laura and demonstrated by a group of zealous laughers making it easy to join in. Laugh Your Way There—Laura's best-selling resource—delivers big fun! Read more. Thanks for checking out the happy stuff at The Laughter Shoppe! Why order here? Because we're the indie artists who make these unique products. By ordering directly from us instead of a third-party-vendor-site, you enable us to keep producing the laughter resources that make the world a happier place. When you place your order, you can rest assured that Laughing Laura will be skipping down the street to personally mail your package to you with a smile. So you can feel fabulous about your purchases! Plus, we'll include a FREE Laughter Pledge Card (pictured right). It's shiny and super cute so you can keep it in a wallet, hang it on your fridge or put it somewhere else where it can remind you of your joyful commitment to contribute to world laughter. Yippee! Make purchases conveniently with the Paypal buttons or call in a credit card order by phoning: 563-880-2699 and we'll laugh with you, then process your order securely with Paypal Virtual Terminal. Shipping for internet orders is a flat rate of just $2 for orders within the USA and a flat rate of only $5 for international orders up to $50 (beyond that it is a flat rate of $10). • Silly Singing: 13 old favorite Sunday school songs and hymns sung by a choir in an exuberant style—sing and dance along to get in touch with your childlike faith. • Guided Meditation: relax into the peace that passes all understanding with this happy meditation to help you rest in God's love. Read more. This colorful poster is a print of Laughing Laura's original painting (from the cover of Holy Hysterics). It's emblazoned with Psalm 95:1. 11x17 inches. Ships in a hard-shell tube. View larger. This hilarious autobiography was written by Labradoodle reject, May McGregor Bourett. It chronicles her first tumultous year, which includes navigating dog politics, fitting into her new family, rejecting a poodle suitor, and meeting Laughing Laura who changes her life by teaching her Laughter Yoga for dogs! There are some doggie treat recipes, too. This one-of-a-kind, 6x9 inch, 112 page book features many full-color  photographs sure to delight dog lovers. Sales help support animal shelters and libraries. Read more. ​ Buy both the Be Laughter and the Ha Ha Spiral magnet together and save a dollar. Great value! Copyright © 2014 The Gentry Joint. All rights reserved.